Eleni’s Christening took place on a gloriously sunny day in the beachside town of Larnaca. After a beautiful ceremony witnessed by close friends and family the lunch celebrations took place at the stunning Galu. Check out the beautiful cake and candy table made by local company The Bake Shop L.A.
Emelia’s Christening was a wonderful day full of so much smiles, warmth and love! We started the day with the baptism which took place at the ancient Archangelos Michael Church in Nicosia, followed by a lunch at the stunning Patio in the Old Town. I loved the decorations and the absolutely gorgeous Christening cake, lovingly baked and decorated by well known local talent Michalis Kalopesas. Miri and Alon were keen to have a much more natural approach to their wedding day, photography that didn’t interfere with the day’s events and were there to tell the story of the day as it unfolded. It was a beautiful day from start to finish, with the ceremony and the party being held at the popular beachside venue Galu on the shores of Larnaca. It was a day filled with so much love and joy. A simple exchange of vows and proclamation of love paying respect to their Jewish faith, and in the company of their closest friends and family, it truly was an honour to be part of this very special day. An infusion of Cypriot and Norwegian traditions, Magnus and Katerina’s wedding was truly a unique affair. Check out some of this here. All set in the beautiful beachside setting of Galu in Larnaca. Andria and Kyriakos both hail from the Paphos area of Cyprus and chose to tie the knot at the chapel in the stunning St George Hotel and celebrate after in its beautiful dining area overlooking the Mediterranean sea. Check out the beautiful wedding dress, the details and the fun party here..
Little Louca travelled to Cyprus with his mum and dad, older brother and a handful of close friends and family. It was an intimate affair held at the small chapel of Ayii Anargyrii overlooking the blue mediterranean sea. Gorgeously decorated in blue and gold flowers and cakes, the church and the intimate dinner afterwards at the Grecian Park Hotel, it really did look stunning. Here are some of my favourite pictures from the day..
Erini and Moritz met in Belgium where they currently reside. Moritz is from Austria originally. As Erini's family live in Cyprus they decided to come over here for their wedding getting married in the stunning St John's Cathedral in Nicosia Old Town. Leyla and Joe are from North London but their parents' origins are a Greek, Turkish Cypriot and Irish mix. 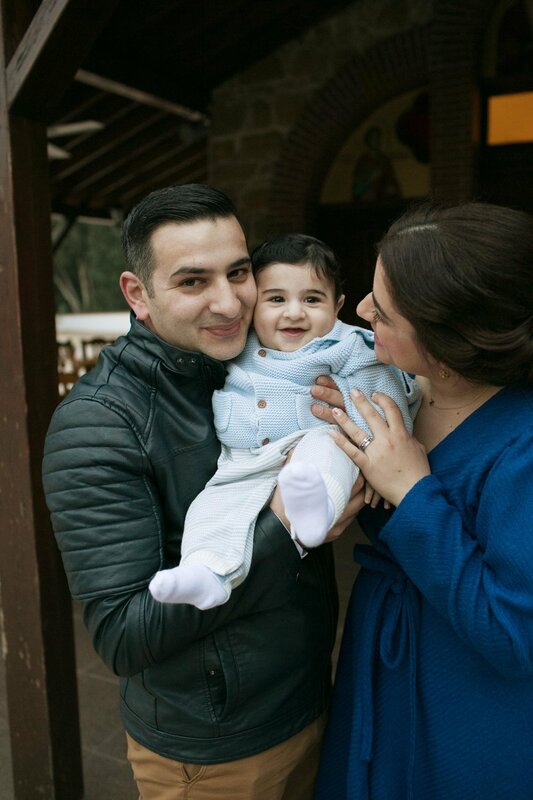 Leyla's father was keen to hold a second wedding party close to the village he originated from, so that all the family including his elderly relatives could attend and meet his new son-in-law. The party was held in a remote North-Eastern outpost of Cyprus overlooking the sea. A further shoot took place on the beach at the popular Acapulco Beach Hotel just outside Kyrenia the next day. These are my favourite images from the day. Craig met Daniela here in Cyprus. With family members abroad the couple chose an intimate and very beautiful wedding overlooking the sea at the gorgeous Grecian Park Hotel. After the ceremony we made the most of the natural beauty of the area to take some pictures. Daniela and Craig. A beautiful love story set in Cyprus..
Ioannis' parents decided on a park location for his post-Christening shoot, a firm favourite with the kids! It was a lovely sunny spring day and we wandered around the park taking various shots as we went. These are my favourites from the day. On a crisp winters afternoon we all met at St Marina's Church in Nicosia to Christen little baby Demetrios. Surrounded by lots of their friends and families, many of whom were familiar to me, Andria and Michaelis baptised their first baby and celebrated with a beautifully-themed snow party at nearby Pavilion in Nicosia. Check out the candy table! Full of gorgeous treats from local cake-maker Boutique. Here are some of my favourite images of the day. Aria Aria is a well-known local health and diet guru specialising in healthy eating and healthy weight-loss. She approached me some time ago for a series of portraits, and these are some of my favourites from what we came up with one sunny afternoon in Cyprus. An intimate portrait session with close friend Tristan Cooper. Baby Ioannis was Christened at the ancient church of Apostolos Thomas in Ergates on a beautiful Autumn day in Cyprus. Surrounded by his loving parents, sister and Godparents his special day was a joy to shoot from start to finish. Check out the truly spectacular "Be brave my little one" Indian Stories themed party at Rancho. Designed by local talents Vanilla Events By C. And the candy table!! One of the most impressive I have ever seen! Put together by cake-make Doxoulla's Art Cake. Here are some of my favourite images..
Evangelia and Thomas married back in summer of 2017 at stunning venue Lexeco in the hills of Lythrodontas in Cyprus. As lovers of nature, It was no surprise therefore that they chose the tranquil Kornos Forest to shoot their post-wedding photoshoot. Check out some of the images we came up with in the magical winter light. Natassa and Leonidas tied the knot on a warm balmy day in late summer. Their preparations were a more relaxed affair than usual and I found myself shooting the intimacy of a clearly very close group of friends just hanging out with each other. Natassa and Leonidas are a fun-loving and very popular couple and it was a total joy to shoot their wedding day. It was simply fabulous from start to finish. Natassa looked absolutely radiant, while eliciting a feeling of cool vintage glamour. Leo's style complemented Natassa's perfectly and the couple looked truly meant to be together. Talented local videography team Cinesen, who are always a pleasure to work with, were there with me every step of the way capturing the magic. Luckily we had time for a quick getaway to nearby Kykkos Park, where we were able to capture some nice relaxed shots of them both in a more earthy, natural surrounding. On to Metropolitan, and just look at how much fun they both had on that dance floor! With a soundtrack supplied by popular local DJ Claudio, the couple and their friends danced the night away into the very early hours. Maria and Theo are based in North London but originate from Cyprus and decided to have a traditional Cypriot wedding on our sunny shores! Maria contacted me very early and is one of the most organised brides I have met, for she booked her wedding and all her wedding vendors over two years before the actual date! A very wise decision as she secured all her favourite individuals who helped her to create her dream wedding. They are a popular couple as their friends and family traveled from far to be part of their special day. And it was so much fun to capture! There was just so much happiness as you can see from the party pictures held at the stunning Ktima MaKenzy in Larnaca. Check out some of my favourite images below..
Louisa met Anthony in South London and last year decided to tie the knot! As Louisa hailed from Cyprus they decided to marry here in front of many of their local friends and family and those from abroad too. The wedding and the reception were both help at the sumptuous Grecian Park Hotel in Protaras, Cyprus. These are some of my favourite images from the day.